Let the Amish Furniture Traditional Credenza bring the stylish storage you are looking for to your office furniture collection. 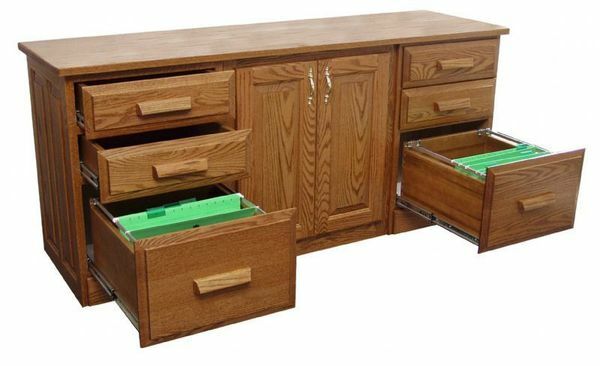 Featuring two spacious hanging file drawers as well as four smaller storage drawers, you'll be able to pull documents and records with ease whenever you need them. Get rid of unsightly stacks of paper in your office with this custom made credenza. Handcrafted in a traditional style, this credenza is a popular choice for your home or business office. The solid wood surface of this lovely Amish made credenza provides plenty of room for flowers, photos and artwork. Browse more of our Amish Credenzas full of customizable features just for you. Contact us today with any questions, or visit our DutchCrafters Furniture Store in Sarasota, Florida to experience Amish furniture in person. The credenza is a significant part of the home office I work in and it the first room of our home that people see upon entrying our home. It receives lots of great compliments. My order arrived on Friday. The desk and credenza are beautiful! They were shipped with extra special care and delivered in pristine condition. Thank you so much for your help with the order. I am 100% satisfied with the desk and credenza and I plan on doing business with DutchCrafters again real soon.